Metal Prints™ represent a new art medium for preserving photos by infusing dyes directly into specially coated aluminum sheets. Because the image is infused into the surface and not on it, your images will take on an almost magical luminescence and vibrant colors resulting in an edgy, stylish display. 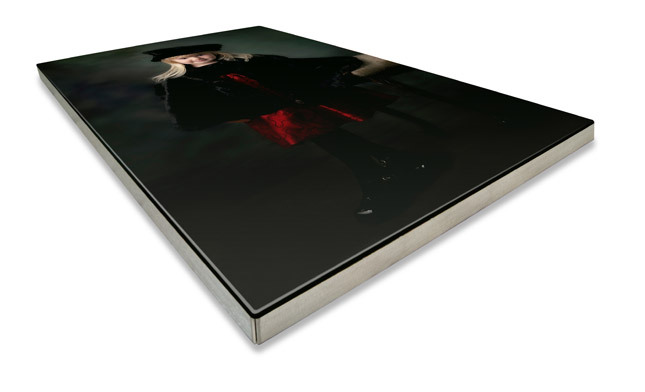 Metal Prints are available in 4 different surfaces: High Gloss, Satin, and Sheer with a Glossy or Matte finish. You’ve never seen a more brilliant and impressive print! Colors are vibrant and the luminescence is breathtaking. Detail and resolution are unsurpassed. Images printed with the Metal Prints process will last for generations when displayed indoors and out of direct sunlight. Like any fine art print, Metal Prints should not be exposed to direct sunlight or high outdoor temperatures. Metal Prints have an additional benefit over gicleé or photographic processes in that they are waterproof and have an ultra-hard scratch resistant coating. The archival value of a print should be judged not only by its resistance to degradation by U.V. light and ozone exposure, but also to moisture and surface damage. When these factors are brought into the equation, Metal Prints are an excellent way to preserve an image.